Apple today announced that its global facilities, including retail stores, offices, data centers, and more, are powered with 100 percent clean energy. Apple's 100 percent clean energy figure encompasses facilities in 43 countries, including the United States, UK, China, and India. In a statement, Apple CEO Tim Cook said Apple is "committed to leaving the world better than we found it." "We're committed to leaving the world better than we found it. After years of hard work we're proud to have reached this significant milestone," said Tim Cook, Apple's CEO. "We're going to keep pushing the boundaries of what is possible with the materials in our products, the way we recycle them, our facilities and our work with suppliers to establish new creative and forward-looking sources of renewable energy because we know the future depends on it." To reach its clean energy goals, Apple has invested in and constructed renewable energy facilities all around the world, such as solar arrays, wind farms, biogas fuel cells, micro-hydration generation systems, and other energy storage technologies. Apple says it has 25 operational renewable energy projects around the world, totaling 626 megawatts of generation capacity. 286 megawatts of solar PV generation came online in 2017, which Apple says is the most ever in a single year. An additional 15 projects are under construction, and once finished, will offer a total of 1.4 gigawatts of clean renewable energy generation across 11 countries. Some of Apple's renewable energy projects include the solar panels on the roof of Apple Park, its newest campus, 485 megawatts of wind and solar projects across China, solar facilities in Reno, Nevada and Maiden, North Carolina, more than 300 rooftop solar systems in Japan, and an 800-rooftop renewable energy system in Singapore. 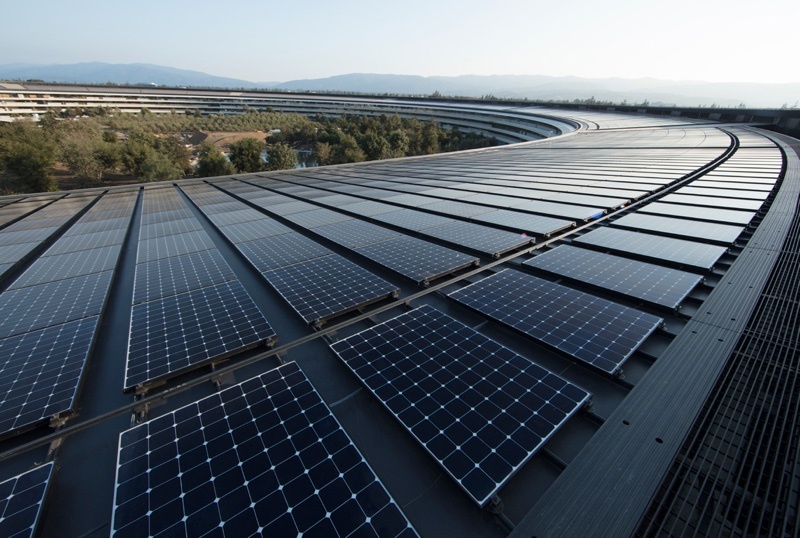 Reaching 100 percent renewable energy for all Apple facilities has been a longtime goal for the company. Since 2014, 100 percent of Apple's data centers have been powered by clean energy, and since 2016, 96 percent of Apple facilities have been run on renewable energy. In an interview with Fast Company, Apple VP of environment, policy, and social initiatives Lisa Jackson said that Apple has been working hard in recent months to ink energy deals to cover its remotest offices and retail stores in countries like Brazil, India, Israel, Mexico, and Turkey. "If you look at our trajectory, for the last couple of years we've been close to 100%," she says. "It's just four percent more, but it's four percent done the right way. So this announcement feels like a classic Apple product release. Like our products, we sweat the details, we have pretty strict standards, and we prefer to wait and meet our standards than to rush and make a claim." Since 2011, Apple's projects have reduced greenhouse gas emissions by 54 percent and prevented close to 2.1 million metric tons of CO2e from entering the atmosphere. Apple has also been pushing its suppliers to use clean energy, and along with its own announcement, nine additional manufacturing powers have committed to using renewable energy sources, bringing the total number of supplier commitments to 23. New suppliers that plan to use renewable energy include Quanta Computer, Pegatron, Finisar, and more. Say what you will about Apple, but this is very impressive. We want to leave the world better than we found it. Thats why we produce unupgradable, disposable products with planned obsolescence to keep you continually buying products that are being produced through the mass exploitation of finite metals and minerals. Pretty cool. Leading by example. how do we know its true? Impressive. Besides climate change, using renewable energy also has its economical advantages and it sure makes the company look good. Hope this inspires many others, whatever their motives may be (I’m personally rooting for the planet). "You just shut your dirty mouth! You don't know what you're talking about! Dirty, dirty, potty mouth!" On topic: But you're 100% right. Others should copy this. Can someone tell me how Apple’s retail stores achieve such? Some of them are located in malls which I don’t think Apple clan control where the power comes from. Do they simply produce more energy than they are using and then use that as a means to claim that they are 100% renewable? They purchase electricity from green energy companies, which feed it into the grid. The energy they consume may not be directly green, but it is offset by the supply of green energy.